What sets the financially successful apart from others? Is there some secret to being good with money, or developing smart financial skills? Did they just get lucky — were they born rich or did they have a wealthy family member provide financial assistance? Those that have hefty bank accounts and even more impressive investment balance sheets might have a few secrets. And sure, some might have had a bit of help via some sort of windfall. But people who are financially successful get that way and stay that way because of some key habits that they practice. The good news is that these are habits the rest of us can put into place in our own lives so we can achieve the same sort of financial success for ourselves. This is Habit Number One for a reason. Most of us know by now that financially successful people grow wealth and, more importantly, retain wealth by being frugal. This means they’re resourceful, they’re not wasteful, and they take care to only spend money on purchases that can either A. provide some sort of valuable return or B. are highly in line with their personal values and understanding of what is important in life. It can be hard to understand why, when you’re in your twenties, you need to care about retirement. This is an inability to see the big picture. Financially successful people know that focusing on the long-term is beneficial to building wealth. They know and respect the power of compound interest, and how a little money upfront can go a long way over time. Financially successful people aren’t scared of short-term market fluctuations, and they know better than to get too excited about big gains. They’re working with the big picture and are in it for the long run. Financially successful people know that they have to make their own opportunities if they want to increase wealth in a significant way. They don’t settle for good enough; they go for great. They find ways to earn more raises at work. They negotiate their salaries at new jobs. They take on work on the side. They start (and possibly eventually sell) their own businesses. They’re not satisfied with doing what they’re expected to do — holding down a job that pays the bills — and stopping with that. They’re tenacious, ambitious, and always interested in how to better leverage their efforts, skills, and time to earn more money. Those that are financially successful don’t just work hard, they work smart — and they make sure their money is doing the same. They don’t let all their cash sit around in savings accounts where it’s not doing any work for them. Sure, they have some liquid assets, but for the most part every dollar earned is a dollar that could continue to do work when it’s invested in the proper vehicles. Some of those liquid assets? Financially successful people earmark a certain amount of funds, kept in cash and easily accessible, to utilize if an unexpected expense pops up. Having an emergency fund and being ready for anything — even unforeseen costs — helps keep those who are financially successful on the right track and out of debt. Financially successful people take responsibility for their own money, circumstances, and actions. They don’t spend too much time wallowing in self-pity over bad decisions or past mistakes. Instead, they use that energy for good: they take action and strive to solve their own problems. You can’t always just pull yourself up by your bootstraps. Sometimes we all need a helping hand. But that doesn’t mean we have to expect someone to come and save us. We can also take action, stay positive, and make a difference in our own lives. 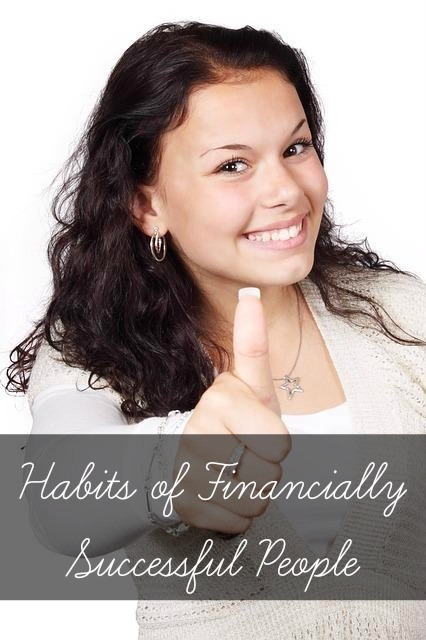 What habits do you practice to be financially successful? I don’t know what constitutes financially successful but I know that living below your means and putting your money to work for you is a smart way to go. Great points here. Excellent point — living below your means is crucial. Great list Kali! I especially think that #2 Seeing the Big Picture is a biggie. You have to be able to look beyond going out for drinks with friends Saturday night in order to see into the future and decide what you want your future financial situation to look like. My habits to be financially successful is by budgeting always and never waste money to unimportant things. It is effective indeed. And by the way, I like this article. You have a great point with it. Great list. As the saying goes, “Ask those who know”. If you want to be successful, seek out the habits of those who are already successful. This will give you an essential starting point on your own financial journey. I do not quite agree with the first habit, being frugal. I know that Chinese people save all the time, and live a frugal life, but by no means we can say that they are financially successful. Most of them are poor.